Four chairs, each with a ball on it, one or two rebounders. 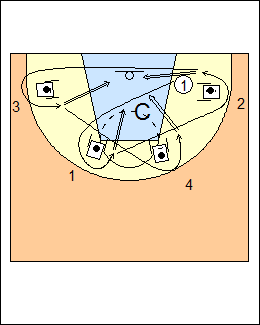 Starting from the baseline on the right, the shooter goes counter-clockwise around chair 1 (a left-shoulder turn), picks up the ball and shoots, then repeats at chairs 2, 3, and 4. See Shooting - 5-spot series (shots off a pass), Eastman elbow pick-ups.